It's back in business - if you glance over the harbour from time to time, the question must have posed itself: "What is that ugly looking vessel with a telescopic black funnel?" At work again for the Dockyard Mooring Section is the Diving Bell Barge, enabling men to work fully-clothed down on the seabed. How exactly is this achieved? The barge has no form of propulsion other than powerful winches controlling the vessel's six anchors. Moving and positioning is done by tugs including the laying out of the anchors. Once positioned, the barge can be manoeuvred to a small degree by hauling on the anchors. The black funnel is in fact a 50 foot steel tube, some four feet in diameter, sealed at the top. The whole tube is made airtight. Air pressure, equalising the outside water pressure for varying depths, is pumped into the tube. The base of the tube opens out like an inverted mushroom to a chamber of 8 feet square with 5 feet headroom. This working chamber, as it is known, is bottomless allowing men to actually step onto the seabed, in effect contained within a giant bubble. Our diving bell is believed to be the only one in the world. The heavy moorings in the harbour have, like most major moorings, three arms extending from a centre ring spanning out along the sea bed and terminating with large 7-ton anchors. In most harbours with soft sea beds, it is usual to lay moorings simply by allowing the anchors to settle in mud, clay or sand but not so in Gibraltar where the seabed in the harbour is hard rock. Initially, the mooring vessel (the other odd yellow and black boat) will lay out the moorings in the appropriate position. Once this is done, the Diving Bell Barge thunders into action. Each of the three anchors has to be well and truly buried. After positioning the Barge over one anchor, the chamber is lowered to the bottom and work in earnest begins. 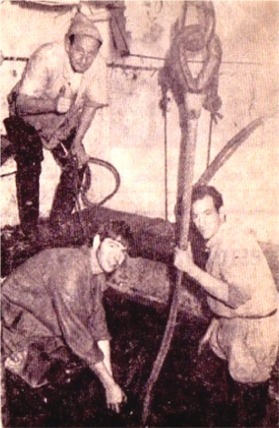 Men pass into the tube through an airlock and climb down a vertical ladder to the working chamber. After marking the position of the anchor, the chamber is used as a crane to lift the anchor and the whole barge is moved to place the anchor to one side. The barge is then returned to its original position and men in the chamber start digging a hole large enough to accommodate the anchor. This is a most strenuous task. Working under pressure in dank, dingy conditions, four men hack away at the rocky sea bed for periods of some four hours at a time with pick-axes, crowbars and sledge hammers. After skimming off a thin veneer of mud, the rock is attacked, first with pick-axes then, as the hole deepens, one man will hold a crowbar whilst another swings a sledge hammer. Hunks of rock are chipped out in boulder form and passed up by hand from the hole. The Diving Bell Barge is just one of the responsibilities of Chargeman of Moorings John Semmens. Seen here working on cable links on the sea bed are three of his staff of eight compressed air workers who do 4-hour shifts. They are Francis Stagno, Manuel Robles and Francis Yeo. Thirty-three feet above, on the surface, would be Chargeman John Garro. We worked under a little more pressure than normal to take this picture – 15 lbs per sq in to be exact. For two or three days, digging is progressed. Not until the hole is shoulder high is it deep enough for the anchor. Once the anchor is buried and the job completed, it will remain undisturbed for several years to come. The PAS mooring vessel Moorland follows up the work of the Diving Bell Barge. 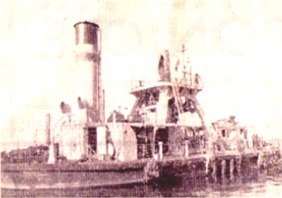 She is fitted with two large 10-ton winches capable of lifting heavy weights from the sea bed when employed in salvage and boom defence mooring duties. She can carry a large amount of cables and anchors for laying moorings, recently demonstrated when providing moorings for the oil rig Mr Louie in the Bay. The Master is Mr Charles Gatt and the Moorland carries two engineers, five deck ratings and 5 engine room ratings. When on mooring work, she also carries a chargeman and 12 deck hands. The work of the Diving Bell Barge is rather like painting the Forth Bridge - by the time she reaches the end of a round of tasks, it is time to start on the schedule all over again.